ORRVILLE, OHIO — The First-Year Seminar course I teach at Wooster is called “Nonsense! (And Why it’s So Popular)“. It is ostensibly about exploring irrational ideas in human society, such as astrology, conspiracy theories, pseudoscience, quack medicine, the “paranormal” and the like, but more fundamentally concerned with critical thinking and writing. It is about skepticism and learning how to test ideas and express the results. It is great fun because there is of course an endless carousel of nonsense to choose from every semester. We’re careful not to ridicule people, but we assess myths and misconceptions ruthlessly. Understanding why people believe weird things (from the title of one of our textbooks) turns out to be just as interesting as the ideas themselves, and it reveals the many filters and barriers between us and “reality” or “truth”. There are fuzzy boundaries around every topic, and our empathy for people who have poorly-supported world views grows throughout the course. Still, we can call some concepts nonsense even if the people professing them are sympathetic. The existence of Bigfoot is unsupported by physical evidence. The claim that Bigfoot has been thriving in Ohio for thousands of years is utter nonsense. So why do people believe that an eight-foot tall hominid has been hiding all this time in the woods and swamps of crowded Ohio? 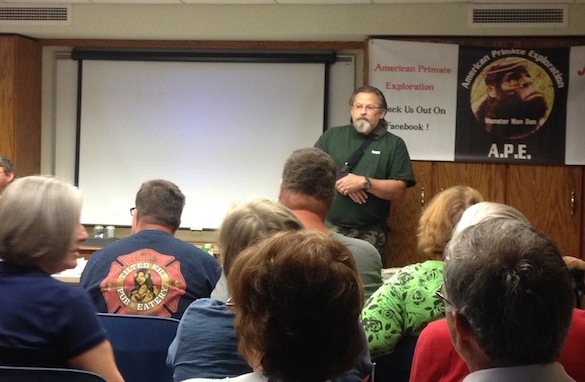 To gain some insight, today my wife Gloria and I went to a Bigfoot presentation held at the Orrville Public Library by the founders of American Primate Exploration (APE from now on!). It was a fascinating two hours. You can see what the primary program was like by watching this video made from an earlier but nearly identical event. 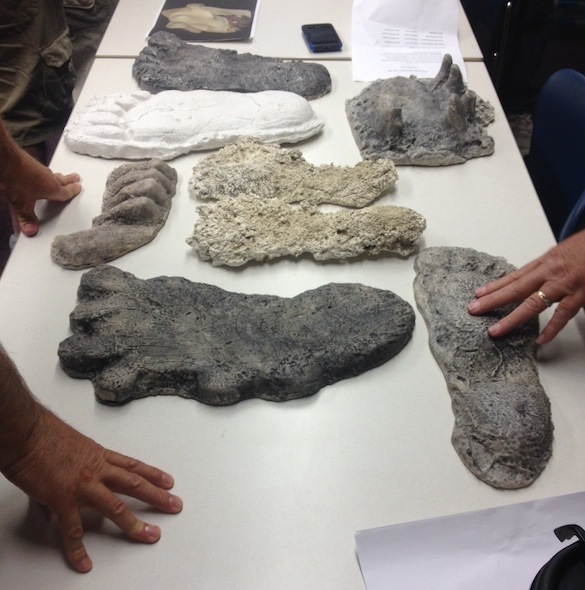 Above is a selection of the footprint casts displayed at the meeting. As you may can see, sorting out evidence for a midtarsal break from a regular human-like arch is dodgy business. Plus, some of those Bigfoot impressions are flat throughout, a feature attributed to “casting errors” by one of the presenters. I was amazed to see that the famous 1967 Patterson-Gimlin film of a “Bigfoot” now named “Patty” was a central piece of “evidence” for the existence of Bigfoot. Mr. Baker breezily dismissed all accusations of fraud on the part of Patterson and Gimlin, which include a confession from the man filmed in the ape suit. This ancient clip, it turns out, is now holy script in the Bigfoot movement, so no skeptical analysis will make a dent in this belief system. 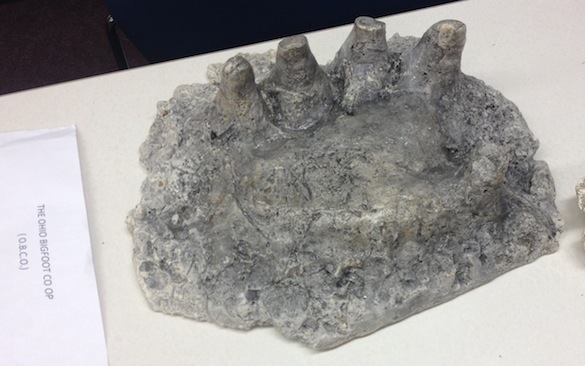 Mr. Baker even brought a footprint cast that he proudly showed was signed by Bob Gimlin himself. A sacred relic. I was introduced to evidence new to me: Bigfoot handprints. Here is one that was apparently made in 1995 by Paul Freeman in the Blue Mountains, Washington. Note the opposable thumb. Pretty impressive how that animal pushed his whole hand down into the mud. (The fingers are shortened here because, one of the APE crew said, “he didn’t clean out the holes first”.) Mr. Baker said that this cast all all the work of Paul Freeman was “legit”, despite claims that the man was a fraud. You can follow up on the Paul Freeman story here: “A few of Freeman’s “Bigfoot-related” discoveries were found to be faked, including manmade hair samples, and a few of his finds remain “unknowns.” (Although softened, this criticism is heresy in Bigfoot circles.) Freeman’s most famous film of a Bigfoot was shown approvingly at our event. Freeman had an unusual ability to find Bigfoot, proponents say. Unusual indeed. After these items, Mr. Baker and the following speaker (Raymond V. Gardner II, APE Field Researcher) spent the remaining time describing their own encounters with Bigfoot in Ohio. Carroll County (about an hour and a half east of Wooster) is a hotspot, as is the area around Spencer in Medina County (just a half hour up the road). In fact, Ohio itself is second only to the Pacific Northwest in Bigfoot reports. The stories were what you would expect: fleeting glimpses before a camera could be deployed, howls and “wood-banging” in the night, “trampled grass” after a night of “activity”. One long segment was an audio recording of an APE team describing some squatting shape in the midnight woods. There was a brief mention of giving some vocal Bigfoot recordings to “a Native American” who could apparently translate them into some sort of pidgin English. (I’ve never heard that before.) I also learned that Bigfoot may be able to “see in the infrared” and thus avoid the ubiquitous trail cameras in the Ohio woods. The questions from the audience were interesting. Most there were true believers from their tone, but some skeptics lurked. One of the best questions asked why we don’t see evidence of Bigfoot in the Pacific Northwest right now as unprecedented wildfires tear through the forests. Shouldn’t Bigfoot be flushed out into the open, or at least a few smoking bodies be found? No, was the answer. Bigfoot is very smart, very crafty, very quick, and very good at hiding. The lack of evidence is not evidence that they don’t exist. I also learned from an audience member that Bigfoot sometimes speaks in “backwards Indian” and “the Douglas Dialect“. My conclusion is that we attended a service with true Bigfoot believers. The lack of evidence for the creature is quickly explained away to preserve the tenets of the faith. 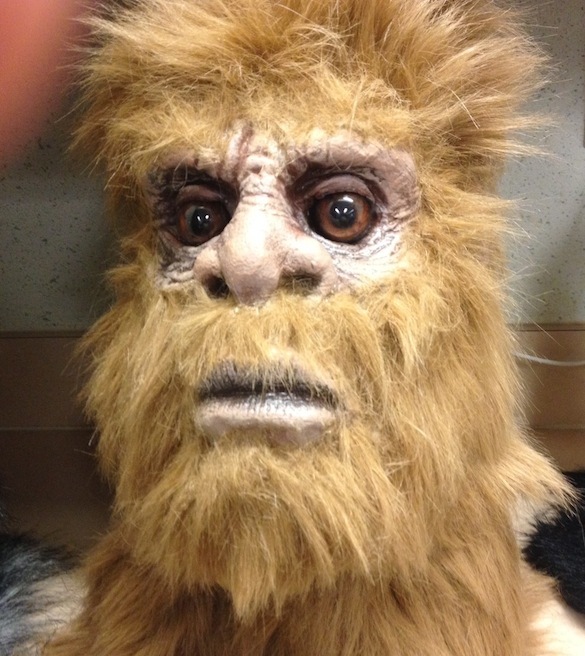 Bigfoot proponents have invested their identities in its existence, no matter how implausible. No amount of scientific skepticism can overcome a belief unencumbered by a need for physical evidence or even biological possibility. Bigfoot believers have a strong community reinforced daily with testimonies and acts of resistance against skeptics. As with any community, there are social roles to fill, from the leadership to “field researchers”. There is even an Ohio Bigfoot Hall of Fame for the ambitious. If your subject is defined by perpetual ambiguity, your arguments for it can be impervious to logical analysis. This was an excellent field experience for me to bring back to my First-Year Seminar class next week. Thank you to the good and earnest officers of APE for the presentation (free to the public), and to the Orrville Public Library for hosting the event. 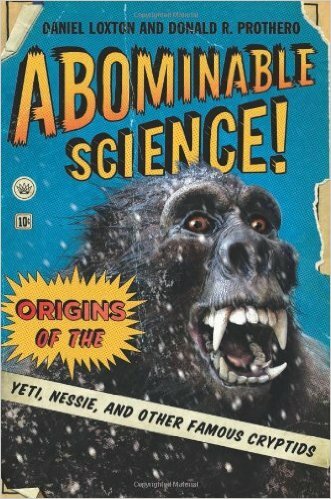 UPDATE: Excellent blog post from Scientific American on the implausibility of Bigfoot’s existence.